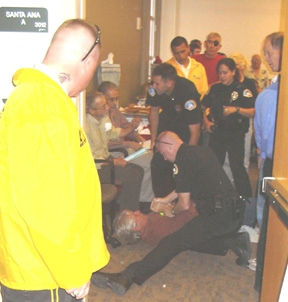 Bob Anderson, leading anti-war activist for Stop the War Machine (SWM) in Albuquerque was tackled, handcuffed, dragged and led away to Bernalillo County Detention Center West by University of New Mexico (UNM) police today at approximately 2:00 pm. The incident occurred at a campus meeting sponsored by UNM in which a panel of speakers for think tank Sandia National Laboratories were promoting the building of a new generation of nuclear weapons. According to one witness, Anderson objected to the exclusion of anti-war views from the makeup of the panel. As someone next to him raised an anti-war placard, one member of the panel asked that it be lowered saying signs were prohibited at the meeting. As campus police entered the room, the panel member pointed to Anderson asking them to remove him from the room. Throughout the entire incident, some bystanders shouted at police to refrain from manhandling the dissenter. No other details are immediately available. UNM ranks in the top 15 universities in the country for war profiteering.